Home >> Positively Contributors >> Why did my dog’s reactivity get worse, when I’m trying my best? Does your reactive dog seem to be getting worse? More fearful, anxious, or aggressive - not less? There are a few key strategies you can put in place very easily that will make a dramatic difference to how your dog perceives the world. 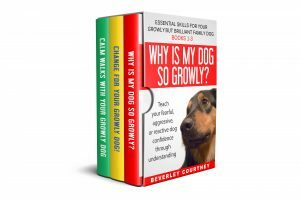 Here’s the second excerpt from my three new books on Growly Dogs - Essential Skills for your Growly but Brilliant Family Dog - out now. This is Chapter 5 from Book 1 Why is my dog so growly? to get you started on the road to change. Chapter 5: Why did it get worse, when I’m trying my best? There are some things that dogs do that will go away on their own. Some puppy behaviours, like chewing, submission-weeing, digging, will simply evaporate if carefully managed. But there are other things - usually the things we really don’t want! - that will build and build, getting worse and worse, until we decide to act. When we do something for the first time, a neural pathway in the brain is built. To begin with this pathway is fairly narrow and hard to find. Think, learning to drive a car - it’s all foreign to us and hard to remember the sequences. But the more we repeat that thing, the wider and brighter the neural pathway becomes until we can just slide down it without a thought. It becomes our go-to response. We can drive on auto-pilot! While this all started as a fear response, it’s now become a habit as well. So while we change the fear response, we will also be teaching new and better habits. If there’s something that’s frightening you, your first instinct is to get away from it. If you can’t get away from it, you’ll try to get it away from you. Hence some manic responses to a wasp in the house! When your dog puts on a song and dance routine of barking, whining, lunging, and prancing, at the sight of another dog, he’s trying to get it to go away. If it works, he’ll keep doing it. Because he has no other course of action to rely on. This well-known expression really comes into its own with the reactive dog. It’s the reason many people think their dog is “fine” off-lead, but turns into a monster on-lead. As we saw in Chapter 1, this dog is usually not as “fine” as people think. It’s only because the off-lead dog has the freedom to move away (flight) that things don’t go badly wrong. Once your dog is tethered to you, however, he knows he can’t flee, so this leaves only fight. This can all be made worse by the fact that he’s unable to express his body language and calming signals. It’s difficult to look nonchalant and relaxed if your head is being held up in the air. This feeling of being restrained or trapped can also be made worse by being in a “tunnel”. This is the stuff of nightmares for many people: ahead is an all-consuming fire, behind is a crush of people and cars - panic! 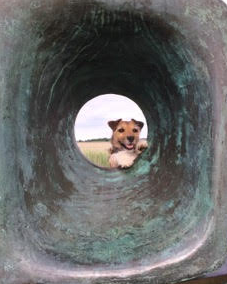 For your dog this tunnel could be made up of walls and hedges and parked cars, as on a street pavement, or can be a real tunnel of a narrow footpath with walls and trees either side. Even being 10 yards from a field barrier - trees, or a hedge - can prompt the fight reflex, as the flight option is limited. And what does the owner bring to this party? Sadly, we often make this all far, far worse. I know we don’t want to, and we think we’re doing everything we can to stop it. But we do tend to add fuel to the fire. If you’re like 99% of reactive dog owners, you’ll be in a continuous state of shock and apprehension when out with your dog - just waiting for something to kick off. So you wind the lead round your hand a few times, just to be sure, to be sure. You keep your dog on a tight lead, close to you - as if creeping through enemy territory and waiting for mines to start exploding any moment. Your understandable fear and anxiety over your dog is now triggering your dog’s outburst. It may be that, up to now, you’ve really had little understanding of why your dog behaves as she does. You know all too well how she behaves! It seems to you that she is unpredictable. She’s lovely at home, so why does she put on this other persona when out? You’ve come to distrust your friend. And this feeling of unease, distrust, panic, seeps into even the calmest of walks. Your dog is now on her toes! If you’re afraid, then there must be something bad out there. Your dog will work hard to locate it and try and keep it away. How stressful a pleasant walk with your dog has become! This is no fun for either of you, and this is what we are going to change. But wait, there’s more you need to know first. Maybe you’ve found that the only way out of this nightmare is to walk your dog at 5 in the morning, or at dead of night - at The Hour of the Difficult Dog. The only people you see are other owners of difficult dogs, who will scurry away like rats in the sunlight as soon as they spot you. You have now become a social pariah. When you first got your dog, you had happy visions of companionable walks with friends and their dogs. What has happened? Walks have now become a chore. There’s no fun here for either you or your dog. You know that what you’ve been doing up to now is not working. So here’s a complete turnaround for you - and you’ll be quite amazed at the difference it will make! I can hear your protests already! Just try it. We’ll address problems and fallout later.